I have a theory about role models. For the last ten years I’ve had the privilege of bringing interesting, inspiring people to the attention of a bunch of folk via talks, interviews, podcasts and blogs. None of them are superstars, none of them are celebs. All of them, in some way, have achieved awesome things. Mystifyingly, the more accessible heroes don’t get quoted but don’t get copied either. Making changes is uncomfortable and takes a lot of hard work. It often involves people around us having to make changes too. With so many great role models to inspire us, why is it that none of them seem to work? Using a dead hero or a seemingly inaccessible celebrity as a role model immediately lets us off the hook. We can’t really aspire to do the same things because those people are too different to us so it’s easy to admire them and quote them (often tiresomely, sickeningly and indiscriminately) without making any attempt to copy them. On the other hand, people who are similar to us, people we know and have met, who live in in the same world as us and who have achieved things we’d like to achieve, are accessible. There is no real excuse for not copying them, not taking them as role models and yet these people often get ignored – not even quoted! Because they make us uncomfortable. We admire them but somehow their success is more like a reproach. They are so much more like us that it should be easy to copy them, easy to make those changes we say we want but it’s hard, so we don’t – but because they are so much like us, there is no excuse – and so we choose to ignore them. Quoting a celebrity, someone who is different to us, allows us the illusion that change is possible. 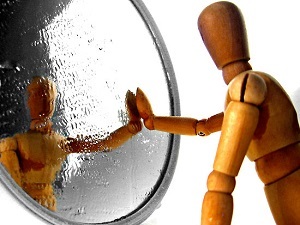 Looking at someone who is the same as us is like holding up a mirror to our ourselves and knowing that we are actively making the decision NOT to change. That’s why its easier to ignore them. So, if we profess to be inspired and still take no action, what is the point of looking for more inspiration? Does it mean that instead of inspiration, instead of looking outside of ourselves, all we really need is to make a decision and take action and that we don’t need role models at all? If you’d like to join the growing group of people who are really enjoying growing their businesses, just send me an email and we’ll look at how I can help. They say you shouldn’t meet your heroes because you will see their human side and ultimately be disappointed. Lance Armstrong used to be my role model: heroic, ridiculous work ethic, and literally a ‘winner’. Guess what I think of him now. I think you’re right; the celebrity role model reinforces the “Oh well, one day, perhaps” mindset of unachievable success. We don’t need role models. What we need is someone else to tell us what they see in us; there could easily be strengths we don’t know we have, and we may have also achieved some of the success that we wanted without noticing, because ‘success’ has become something that is set in the future. What a great insight Jon. I agree: it took someone else to tell me that I was a writer before I thought of myself as one. The idea that success is somehow set in the future is also interesting and I guess that comes down to answering the question “what will success look like?” when we set our goals. Thanks for your thoughts, they’re really interesting. I don’t often say this to you Jon, but I don’t agree. I think some people can be inspirational without being a mentor. Inspiration is a by-product of what they do whereas mentoring is a very active role. Inspiration can help. I was recently reading Alan Sugar’s autobiog, and drew a lot out of that. But the problem, as Jon T avers, is in applying someone else’s life lessons to one’s own. A lot of people, self included, consider the Dalai Lama inspirational…but not many become Buddhists, or actually do more than nod sagely at his comments. The same applies in business. The biggest winners are usually people who were lucky in their early career, and had the skills and temperament to capitalise on that luck. The skills can be taught (to an extent), the temperament can’t, and, whilst I sympathise with the idea that you make your own luck, you can’t control randomness. That makes it troublesome to try to relate others’ lives personally, however much we’re affected by the story. Inspiration is a river, and it flows in one direction only: from rôle model to recipient. It’s like TV. Mentoring, by comparison, goes in both directions: it’s interactive, like the Internet. That inspirational person can learn your business, and you, and apply their life lessons to improving both – and at the same time, learn more themselves that they can use to help, mentor and inspire others. And that’s the point I’m making. If you find someone who’s inspirational, but reachable – have the courage to reach out to them! Make them a mentor instead, and you’ll both grow from the meeting of minds. Oh, I love that! “Inspiration is like TV and mentoring is like the internet.” Yes. I’ve been helped by so many people over the years and it all goes in the pot, gets mixed up with other things and comes out to help someone else in different circumstances. We all have mentors or Role Models in business, although we’re not always aware of the role they’re playing. My first and best mentor was my late father back in my homeland Lebanon. A man bigger than life in the trading and investment business who taught me all there is to know in the space. It’s ironic, I suppose, that growing up I never wanted to go into business. I had no desire to follow in my father’s footsteps. But life is funny, and I eventually wound up in business anyway. Only then did I begin to realize how much my father had taught me. At the time, however, I didn’t appreciate the education I was getting. I was only 12 years old. He was the one, for example, who first explained to me the importance of maintaining high gross margins. He called them something else — big markups — but the thought process was the same. “Always make a good sale with a big markup,” he’d say. “Make sure your customer is someone you can collect from.” “Don’t take advantage of people.” “Be fair.” Those are fabulous business lessons embedded in my mind, and they came straight from my father. I use ‘invisible friends’. I should probably explain that before you assume I am 4. When I have a task at hand, I think about the people similar to me who would be disappointed in me if I gave up on something. Usually, they are highly competent in the field where I want to be doing something, and usually they are people I know very well. I don’t want them to go ‘aw never mind’. I think I want to avoid the discomfort of it, to use Ann’s term. Many of them are not mentors or even potential mentors, but they are ‘me models’, not role models. They represent what I want to be in a particular world. There is a second part to this that Ann has only briefly touched on, though. When you quote a celebrity, you get a sense of release or relief at having done something, which is similar to sharing hopes without sharing plans. You get positive feedback just from the act of sharing, and when that fades, you are left on a down-slope, and it is easy to stop at that point. Unless you have a plan in action, quoting is the equivalent of hoping. It lets you off the hook because you have done something, and the guilt of not doing it is gone. I agree Ziad, those are wonderful lessons. If we can count our parents as role models in business as well as life we’re doubly blessed. “Sharing hopes without sharing plans” I guess is the equivalent of making a wish. As you say, Diana, without some kind of action, that’s likely all it will ever be. I love the idea of invisible friends. In life, rather than business, my mother, long dead, still fills that role, an invisible but powerful guide to doing the right things just because its the right thing to do.